Disclaimer: This is a preview, and may be subject to change. 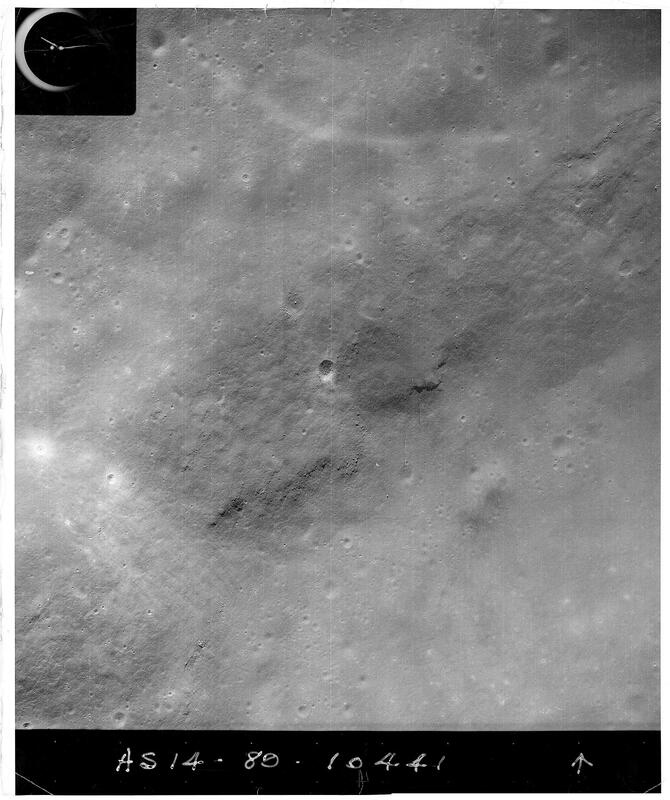 Apollo 14 took high-resolution photos of the lunar surface from orbit with a modified Hycon KA-7A Aerial Reconnaissance Camera. The results produced from these military-grade optics and large-format film would be of incredible high resolutions. 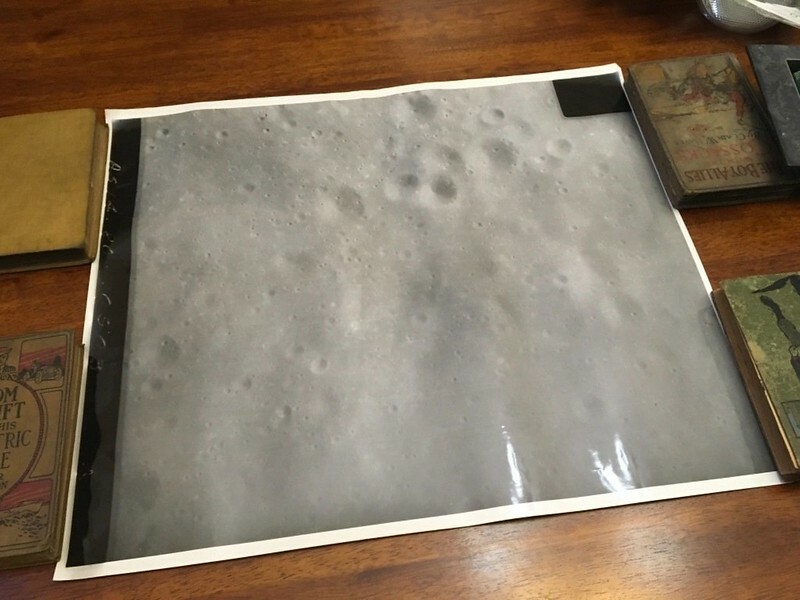 And while other large-format photos of the lunar surface taken on Apollo 15, 16 and 17 are online in a mind-boggling 4.8 Gigapixels, high enough to discern Apollo equipment at the landing sites, high-resolution scans of the Apollo 14 KA-7A photos are missing. The magazines used in the KA-7A camera were numbered AS14-79 and AS14-80. Notes: Awe130 has high-resolution scans of his catalog, but does not want to publish them. Perhaps someone from here can request access to the high-res scans? Notes: As14-80 frames start at PDF file page 9. Because I have acquired ten 20"x24"inch prints of magazine AS14-80 and together with Paul, am working on scanning and processing them. We will present an other source for the images, and in much greater resolution and fidelity than previously online. Most of our scans were previously only available as ultra-low resolution scans from the Apollo 14 photo catalog. We will be providing the highest-resolution scans of these photos online to date. I use my Epson Perfection V750 Pro to scan the gargantuan print in 6 sections, making sure there is ample overlap between the scans. Vuescan 9 outputs two files, a contrast/brightness enhanced scan, and the uncorrected RAW scan. Both files are saved as 16-bit grayscale uncompressed TIFFs. Sharp prints are scanned at 800 DPI, soft prints are scanned at 300 DPI. Paul then uses photoshop to merge the 6 individual scans back into a single image. The combined scan is saved in two versions; the uncorrected RAW version, and a contrast enhanced, sharpened version to try and get the most detail out of the prints possible. Due to the nature of this process, there may be some visible stitching where two scans meet. The resultant image resolution is 307 Megapixels. Once all the prints have been scanned and processed all the individual scans and merges will be provided, in RAW and enhanced. Please tell me what you think! I and Paul would like feedback. Good luck with awe130, gone before my joining. But by reputation he is a rather difficult man to deal with, concerning Apollo. I doubt he will share with anyone any real data that might prove him wrong, again. I have been trying for about half a year to get his high-res scans, but he will not budge. I am convinced he does not have higher-res scans than the ones he puts online, for some unknown reason. He does not have the Hi Res scans his images come from the original scans from the image catalogue published just after the mission, his images are from that publication and are very low quality. The two hi res scans you have already found seem to be the only ones in existence. I don't know why these images were never part of the re-scanning of the images. OBM IIRC has a copy of the document or two of the missing pages? AWE's images were negatives and possibly from the original plates used to print the publication. Edit:- And knowing Adrian as I and a few others here do, if he'd had any of the Hi res scans he would have published them and crowed about it. There are long discussions regarding MAG 80 on the AWE130 members only thread, this comment from OBM was on page 181. "Readers with long memories may remember the convoluted and nonsensical claims made by our reluctant member about Apollo 14's Magazine 80. I have managed, through a perfectly sensible route that I am not willing to divulge publicly for fear of inundating my source with stupid spam (but which is completely obvious to anyone who can do joined up thinking) to acquire decent quality scans of the 'missing' 4 photographs from Magazine 80 - ie the 2 missing pages from the document hosted by ASU. I will be posting them online when I get home and forwarding them on to the ALSJ. They are considerably better than the poor quality versions Adrian has posted from his fiche copy (prove otherwise Adrian), and they are from original photos, not the Photography index. If anyone is curious about the source, PM me "
I'm sure GoneToPlaid did a video a few years ago that showed LM Falcon in Apollo 15 orbital photos. You can even see the details change as the missions progress. The Panoramic camera was another one of those 'contains secret stuff' things that had remarkable resolving capability, second only to the LRO. As far as I'm concerned Adrian lied through his teeth about having a better source, and only ever had a microfiche version of the report available everywhere else. If he had better material, he would have published it. His problem (aside from delusions of grandeur), as so often occurs with Apollo hoax nuts, is that he uses Apollo to disprove Apollo, those Hycon images are very detailed and show things you can only see on modern high resolution imagery of the same area. Would you say the Hycon photos have a higher resolving power than the mapping camera and pancam images? even with the much lower-resolution scans available to us right now. and I would say as a rough guess the Hycon has double the resolution of the Panoramic one. I'm going to download the relevant tiles for study later. What else is disk space for?! That is sick! Is the hycon photo a tiny crater inside the THEOPHILUS crater? Unfortunately I don't have nearly enough experience to find such a small detail, is it possible you can screenshot the AS16-P-4522 preview on the NASA website and circle the area where the crater is? I would be interested in a comparison between the panoramic mapping camera, the LRO and the Hycon. Given how far you can zoom in into my Hycon scans, I say it is more than double the pancam! I hope we can make comparisons with more equal lighting and viewing angle, but I guess we do not have that luxury. That is sick! Is the hycon photo the THEOPHILUS crater? Yes, it's the Eastern edge of Theophilus, roughly -11.19079, 27.75183. There will be some segments of Theophilus that have comparable lighting from the LRO but not the specific bit that I picked there (just to the left there would have been! Obviously LRO is much better but considering the age of both the Hycon and Panoramic cameras the resolution is remarkable. You can see why they weren't keen on the Soviets knowing just how good they were! Very good, I bet if the sun angle was the same in the Hycon photo it would have almost the same resolution. 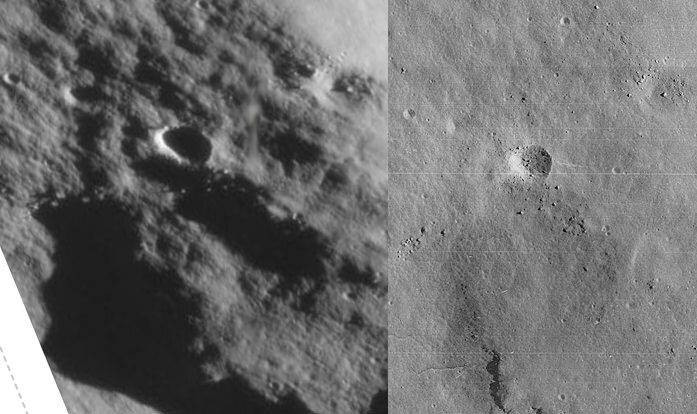 the LRO photo appears higher resolution than it actually is due to the greater shadows. Is that the LRO at maximum magnification? To be fair it is just a screenshot of the LRO quickmap at maximum zoom, rather than the image itself.